This is a large, bright and clean 2 bedroom and 2 bath first floor Condo. Brand new kitchen, just fully remodeled with new cabinets, granite and stainless steel appliances. Remodeled bathrooms. Being first floor gives you extra entrance through patio which is very convenient and easy access from parking lot or lobby. Also one of the few condos with a private patio with new furniture to enjoy the beautiful weather and water view. Very easy access in and out of condo. Only first floor condos also have an outside patio to enjoy the weather along with the screened in lanai. Condo clean and bright and beautifully decorated. Brand new kitchen as of July 2018. Split floor plan with living room in center splits the bedrooms for privacy. Each bedroom has own full bath. Condo is fully supplied with everything you need. Linens, fully equipped kitchen, beach chairs and towels, fishing poles and tennis rackets and balls. Also beach chairs, umbrellas, cooler and beach toys. You see the water every time you walk in and out of the condo. You really feel like you are on vacation!! One bedroom has a king size bed with large closet and newly remodeled private bathroom with granite vanity and new tile shower. 2nd bedroom has 2 queen beds, walk-in closet and also has a private bathroom that is also newly remodeled. Each bedroom is on opposite sides of living area and is its own suite for privacy. Each bedroom is also has a flat screen TV. in the room. Condo also has a large living room/dining room area with Flat screen TV, DVD and a library of Dvd's. Living room goes out onto private screened in lanai, great for eating meals outside or enjoying warm breezes. Kitchen is equipped with everything you need. Because this unit is on the first floor you have what other units do not have. You have a screened in lanai and you also have a second outside tropical private patio with partial water views. Although unit is a first floor unit it is not on the ground floor, it is raised about six steps to the private patio. This unit also gives you the convenience of having two entrances. You can enter through the main entrance into large beautiful lobby area or you can enter through the private patio right across from parking spot. It is a lot less walking to enter the unit. Very convenient when carrying items or returning from beach. You do not have to carry beach chairs, supplies and sand into the condo. There is a convenient storage bin on the deck, leaves condo sand free. When going to marina or pool, you do not have to go through the lobby each time, they are just a short walk from unit. It is so perfect looking at beautiful water and marina, every time you go in and out of the condo. You really feel like you are on vacation. 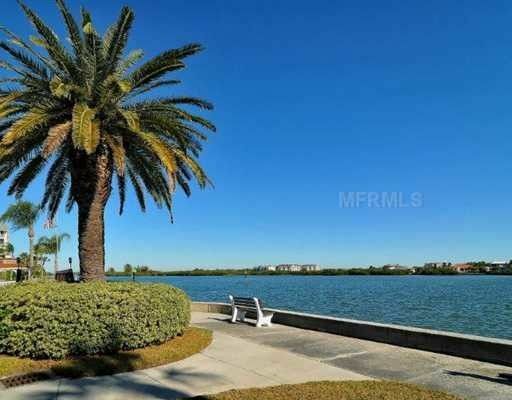 Just walk out of your private stone patio and see the magnificent marina, gazebo and inter coastal waterway. You really feel like you are in paradise. There is a beautiful heated pool and a separate heated kids pool. There is also a large patio with gas grills, great for outside BBQ's by the pool. There is also a fitness room and Sauna. There are three Har-Tru(clay) tennis courts and a marina on the intercoastal waterway. You can fish just steps away from condo by the marina (poles and tackle box in condo) or sit and relax in the gazebo and watch for the dolphins swimming by. Condo is only a short walk or drive to Siesta Key Public half mile or less to public Beach, the #1 rated beach by the Travel Channel. It is only a 3 minute drive to public area of beach. If walking, there is beach access two complexes away. It also only a 5 minute drive or mile walk to Siesta Village, with quaint shops, outside restaurants and great shopping and live music. Previous guests love sitting or fishing with the kids just steps from the condo. Harbor Towers is a beautiful well maintained complex with Har-tru tennis courts, beautiful pool, gym, very spacious. Perfect for a night drink on the water, so relaxing. Or also perfect for night fishing. Lounge chairs, bbq are also right on the water. Harbor Towers is a perfect complex for couples or families. Harbor Towers is a beautiful complex on the water with plenty of beautiful places to sit and enjoy the boats going by. There are two pools one heated and Har Tru tennis courts. Our condo has two new baths and a fully remodeled kitchen. We are on the raised first floor which are the only ones that give you a private screened in lanai and a private outside patio to relax and enjoy. The best of both worlds. Only a short walk to the #1 beach in the USA and The Village. Private Patio and Private Lanai. Easy in and out access to condo. View of beautiful marina and easy walk to pool and gazebo on the inter coastal waterway. All linens, towels and beach towels are provided for your convenience. Washer and dryer is located at the end of the hall. It is very convienient. Easy parking under private space under carport so car stays cool and out of the sun. Condo being on 1st floor is very easy access from parking spot. Newly renovated gym with all new equipment. WiFi internet access in condo. Kitchen is fully equipped with everything you need. The kitchen is newly renovated as of July 2018 fully equipped with any thing that you might need. New Stainless steel appliances, granite, lots of lighting. New flat screen T.V,'s in bedrooms and in living room. There is a full book library in the lobby where you can help yourself to books. Amazon Alexa dot is provided for music. You just have to say Alexa play___ and she will play what every you want. Kayak dock in complex at marina. Must supply own kayaks. Beautiful pool area with tables with umbrellas for shade and plenty of lounge chairs to relax. Really well appointed condo with a brand new kitchen. All the other areas including the outside patio are in really good condition. Stayed here for two weeks and we were really pleased and comfortable in this condo. Ruth the owner was extremely helpful and a delight to deal with throughout the booking process. We've stayed on Siesta Key a number of times, but this was our first time at Harbor Towers. As a family of four we would highly recommend Harbor Towers. It has lots of extra facilities (Gym, pool(s) BBQs etc), convenient for the beach and village and having an area to relax on the inland waterway was a godsend due to the issues with red tide and the beach. Very easy to find and access the property. We found everything we needed in the house for cooking, the beach and chilling out! We loved the pool and the view. We would gladly stay there again!! We had a wonderful stay! It’s a first floor condo with private entrance. Everything you would need is available. Two separate bedrooms each with their own bathroom. Heated pool, tennis court, minutes away from the best beach! A lot to do around the area. Owners were very pleasant and easy to work with. Answered questions immediately. We will be staying again! We enjoyed our time. Lots to do right where your staying. Nice pool, loved the barbeque patio. Beautiful condo with all.of the amenities you need! We will be back!